Lacombe, Alberta – Canadian country music star and Sony Music Canada recording artist Gord Bamford raised a total of $386,175 at the 9th Annual Gord Bamford Charity Golf Classic in Alberta, Canada, August 3 and 4, 2016. Artists Bobby Wills, Tyler Connolly, Buddy Owens, Duane Steele, Beverley Mahood, and Gord himself took the stage and entertained the 700 people who attended the sold-out private event. The Gala took place at the Sheraton Hotel in Red Deer, near Bamford’s hometown of Lacombe, Alberta. Bamford contributes the event’s success to strong community supporters, the music community, and of course the sponsors and volunteers. Alberta-based businesses JEDCO Energy Services served as the event’s title sponsor, with Waschuk Pipeline Construction Ltd along with ETC Event Styling & Décor joining together as the venue sponsors. 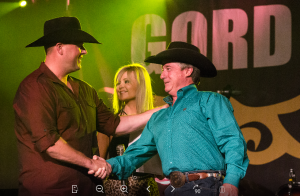 Two surprises unfolded during the evening, first, a youngster who is part of the Make-A-Wish program of Northern Alberta was joined up on stage with Gord Bamford who granted him his wish of brand new roping gear so that the young man can continue participating in his favourite pastime. The second, was a visit up on stage from Gord Bamford’s Big Brother from the Big Brothers and Big Sisters of Lacombe & District, one of this year’s featured charities. On the golf course, for the first time ever at this tournament, a guest made a hole in one at the Lacombe Golf and Country Club which landed Robert Gardiner a $10,000 cash prize. Contributing to the fundraising total were 2 private Gord Bamford concerts that were live auctioned off by auctioneer Danny Hooper for $25,000 each. A Top Shelf Experience donated by the Calgary Flames was also an exciting item up for bid. Celebrities and athletes were auctioned off to guests who paid up to $10,000 for the opportunity to have the celebrity join their golf team the following day. The list included, hockey players from the Bentley Generals, Curtis Glencross and Kris Russell, as well as Rodeo Champions Denny Hay, and Davey Shields Jr.
“Central Alberta is a wonderfully strong community that really knows how to rally behind a cause, despite the difficult economic times that Albertans are facing. The organizations we support change lives for the better, and we’re so proud to be part of so many worthwhile causes through our annual event,” said Bamford. Monies from this event are the main source of fundraising for The Gord Bamford Charitable Foundation and are delivered to a variety of youth-centered charities across the country. The next charity to receive a donation will be the London Children’s Health Foundation who be getting a $10,000 donation during Country Music Week at the upcoming CCMA’s in September. About the Gord Bamford Charitable Foundation: As a not for profit organization, The Gord Bamford Foundation is passionate about supporting youth. As a Foundation we provide funds for initiatives that include or involve music, education, health care, sports, and multi-use facilities that benefit youth across Canada. Lacombe, Alberta – A star-studded line up of performances including Tyler Connolly, lead singer from Theory of a Deadman, Beverley Mahood, Duane Steele, Bobby Wills, Buddy Owens, and of course Gord Bamford himself will be delivered this Wednesday, August 3rd at Gord Bamford’s 9th Annual Charity Golf Gala taking place at the Sheraton Hotel in Red Deer, Alberta. The event will deliver exciting live auction items including everything from a Calgary Flames Top Shelf Experience, to a Breakfast With Gord Bamford In Mexico Package, which includes a trip to the luxurious Marival Resort & Suites in Mexico. This includes a breakfast with Gord along with a 4 hour fishing excursion with him while the winners are there. Adding to the excitement are several celebrities and athletes that will be auctioned off to the golf teams and companies who have sponsored the event, which allows them to enjoy a round of golf the next day with the celebrity they’ve purchased. To name a few, NHL players Kris Russell and Curtis Glencross, as well as pro rodeo cowboy Davey Shields Jr. have agreed to be auctioned off this year. The private event will be co-emceed by singer/songwriter and television host Beverley Mahood and Chris Sheetz of CISN Country 103.9 in Edmonton. 700 guests are expected at the Red Deer, Alberta Sheraton Hotel, starting at 5:30 p.m. on Wednesday, August 3rd. The Gord Bamford Charity Golf Classic takes place at the Lacombe Golf and Country Club in Bamford’s hometown the following day. “It’s always an exciting week for The Foundation team and for myself, as I get to interact with some of the charities that we support, our sponsors and supporters, and of course pay a visit to my hometown,” said Bamford. At the event, both Make-A-Wish Foundation of Northern Alberta and KidSport Alberta will be receiving their donation cheques from the Gord Bamford Charitable Foundation. About the Gord Bamford Charitable Foundation: As a not for profit organization, The Gord Bamford Foundation is passionate about supporting youth. As a Foundation they provide funds for initiatives that include or involve music, education, health care, sports, and multi-use facilities that benefit youth across Canada. Lacombe, Alberta – Alberta-based business JEDCO Energy Services have stepped up to offer their support as the title sponsor of the 9th Annual Gord Bamford Charity Golf Classic. Coming to the table for the past 3 years, the Gord Bamford Foundation is grateful for their ongoing commitment. Waschuk Pipeline Construction Ltd along with ETC Event Styling & Décor are this years’ venue sponsors. A welcome back to Red Deer’s KG Country and CTV Edmonton for their continued support, as they join up once again as the radio and television media sponsors. For three years now, JEDCO Energy Services has been part of the title sponsorship. “Our support of the Bamford Charity Classic is driven by Gord’s passionate belief in helping others. Once again, we are honoured in assisting Gord through our sponsorship of this event,” says Duane Sokalski, Vice President & Construction Manager, JEDCO Energy Services. Bamford understands the significance of sponsorship, especially as the Alberta economy faces yet another difficult year. “We know that events like ours are just not possible without strong sponsor support. We enjoy working with all of our sponsors, and are thrilled to see them return year after year,” says Bamford. The featured charity at this event is the Big Brothers and Big Sisters of Lacombe & District as The Gord Bamford Charitable Foundation has committed to providing them with $100,000 over the next 5 years to ensure they’ve got a new home location to serve even more youth than before. Make-A-Wish Foundation of Northern Alberta and KidSport Alberta will be receiving cheques prior to the gala evening commencing. The country-casual event begins Wednesday, August 3, 2016 at 5:30pm, at the Sheraton Hotel in Red Deer, Alberta where 700+ guests will enjoy an evening of country music, fun, and philanthropy prior to a day on the course at the Lacombe Golf and Country Club on Thursday, August 4, 2016. Lacombe, Alberta – For the 9th year in a row, the Gord Bamford Charity Golf Classic is back with the mission of providing funds to youth supporting charities across Canada that involve music, education, health care, sports, and multi-use facilities. The Golf Classic’s board and committee members have continued to deliver on that mission year over year, generating over 2.3 million dollars since the first tournament in 2008. As the main source of funds to the Foundation, the Gord Bamford Foundation is hard at work building another fantastic event for attendees. This year’s ‘country-casual’ event will take place Wednesday, August 3, 2016 at 5:30pm, at the Sheraton Hotel Exhibition Hall in Red Deer, Alberta. The invitation-only Gala evening will see 750 people turn up to enjoy an evening of world-class country music, grassroots charm, exciting auction items, and a wonderful buffet dinner prepared by the Sheraton Hotel’s chefs. Golf tournament day will host a full golf course of 46 teams, and takes place at the Lacombe Golf and Country Club, Thursday, August 4, 2016. “I’m so very proud of what this event has achieved over the last 9 years and I’m always excited to reconnect with the supporters and friends that come out each and every year. It’s heartwarming, to say the least, to know that so many folks share my vision of supporting the deserving causes that the Gord Bamford Charitable Foundation has chosen to give back to,” says Bamford. Thanks to the generosity of businesses, supporters, golfers, and sponsors, the Gord Bamford Charity Golf Classic raised a record-setting $508,350 last August of 2015. These funds were proudly distributed to a number of youth-serving charities like Big Brothers Big Sisters of Lacombe and District, KidSport Alberta, and MusiCounts just to name a few. Children’s hospital foundations across the country from Calgary, Edmonton, Winnipeg and Halifax also benefited from the Charity Golf Classic. Big Brothers Big Sisters of Lacombe & District are set to receive $100,000 in funding from the Gord Bamford Charitable Foundation over a 5 year term. As the new title sponsor of the charities’ Building Campaign the hope is to build both the level and amount of services by giving the resources needed to create a permanent home for Big Brothers Big Sisters of Lacombe & District. Gord’s first ever Charity Golf Tournament in Lacombe, Alberta took place in 2008 with the funding directed to the BBBS of Lacombe & District, and since, the Gord Bamford Charitable Foundation has donated $130,000 to the charity. The timing of these funds were a real game changer as they helped not only save the charity, but assisted in growth and expansion as the organization jumped from serving 35 youth to 200. The charity was able to expand services to include Blackfalds and Eckville, and now currently serves all of Lacombe & County. As a youngster in the program, Gord has experienced having a Big Brother of his own, and personally knows the benefits of having a mentor to rely on. “It makes this partnership just that much more meaningful. It allows me to express my gratitude, and to give to a charity whose mission I’ve benefited from first-hand,” said Bamford. “The Board of Directors recognized the need for a new home for our organization. Our current situation was coming to an end, and we knew that meant some difficult times ahead. Gord and his Charitable Foundation Board saw our vision and the benefits of creating a permanent home, and we welcomed their offer to become our Title Sponsor. Our partnership with the Gord Bamford Charitable Foundation is one we are proud of, and one of many partnerships we can rely on for the health and future of our operations” said Darcy Stingel, Board Director & Building Committee Member – Big Brothers Big Sisters of Lacombe & District. Halifax, NS – As Halifax enjoys hosting the Canadian Country Music Association’s Country Music Week (September 10-13, 2015), Gord Bamford is helping keep the Music Therapy program healthy with a visit to the IWK Health Centre. Bamford is donating $10,000 from his Gord Bamford Charitable Foundation to the Music Therapy program. The cheque presentation is set for 3:00 p.m., Friday, September 11th, 2015 at the IWK Health Centre. The IWK Child Life’s Music Therapy program uses music as the main avenue for working on health care and quality of life goals with patients and their families. Music therapy sessions involve finding creative ways to incorporate music into a patient’s healing process. Studies have shown that through musical therapy, patients’ stress levels are reduced, sensory and cognitive skills are developed, and there is an increase in self-confidence and self-esteem. Bringing home an award from the Canadian Country Music Awards 19 times, and garnering 6 nominations for this Sunday’s award show, including the dear-to-his-heart Fan’s Choice award, Gord Bamford continues to work toward delivering the best in country music and continuing his charitable efforts along the way. Lacombe, Alberta – Canadian country music star and Sony Music Canada recording artist Gord Bamford set a new record fundraising total of $508,350 at the 8th Annual Gord Bamford Charity Golf Classic in Alberta, Canada, August 12 and 13, 2015. Contributing to that total was a single live auction item that went for a generous $45,000 at the events’ Gala. The item was a vacation to one of Luxus Development’s luxury properties in Tuscany, Italy called Podere Panico. The Gala took place at the Sheraton Hotel in Red Deer, near Bamford’s hometown of Lacombe where he opened the night with heartfelt remarks and a welcome address expressing his overwhelming gratitude for the support. Bamford attributes much of the event’s success to strong community supporters, the music community, and of course the sponsors and volunteers. Alberta-based businesses and Waschuk Pipeline Construction and JEDCO Energy Services served as the event’s title sponsors, with Hopewell Developments and ETC Décor joining forces as the venue sponsor. Artists Beverley Mahood, Jess Moskaluke, and Gord himself took the stage and entertained the 800 people attending the sold-out private event. Bamford surprised guests by introducing the legendary Marty Stuart and His Fabulous Superlatives and fabulous doesn’t begin to describe the performance delivered by the Grand Ole Opry member. A cavalry of songwriters from Nashville and beyond showed guests where many of the songs they’ve grown to love came from. This group boasted Buddy Owens, Galen Griffen, Duane Steele, and Monty Holmes who blew the audience away with their acoustic performances and by sharing great stories from the world of country music. 17 celebrities and athletes were auctioned off to guests of the Gala who paid up to $10,000 for the opportunity to have the celebrity join their golf team the following day. The list included hockey players like Theo Fleury, Marty McSorley, Curtis Glencross, and Shannon Szabados. Rodeo Champions Rod & Denny Hay, and Davey Shields Jr. also went out the highest bidding team. “Central Alberta is a spectacular place to bring together a group of supporters to really celebrate the work that these great charities do. The organizations we support change the lives of people in their communities, and for that reason, we’ll continue to build on the success of the event so the Gord Bamford Foundation can continue to give. I’m absolutely honoured and grateful to everyone involved,” said Bamford. Monies from this event are the main source of fundraising for The Gord Bamford Charitable Foundation and are delivered to a variety of youth-centered charities from children’s hospitals across Canada, to KidSport Alberta and Ronald McDonald Charities Central Alberta, to this years featured charity MusiCounts. Lacombe, Alberta – Star-studded concert experiences and more will be delivered this Wednesday, August 12th at Gord Bamford’s Charity Golf Gala taking place at the Sheraton Hotel in Red Deer, Alberta. A special addition to the 8th annual event is the iconic Molson Canadian Beer Fridge that will grace the Gala with the ultimate Canadian experience. The proudly Canadian fridge was launched in 2013 and gained momentum during the 2014 Olympic Winter Games in Sochi, Russia where only a Canadian passport could open the fridge door. The fridge has since undergone a transformation where it now requires the Canadian National Anthem to be sung correctly in order to crack the door for the singer to earn a beer. “We understand that Molson constantly fields requests from Canadians coast to coast wanting the Beer Fridge in their homes, their cottages and at their events. Even the Canadian Embassy in Paris asked for it! So as a proud Canadian, I’m both flattered and really excited that it’s visiting our Central Alberta event this year,” says Gord Bamford. The event will continue to deliver exciting live auction items including everything from a trip to a 16th century Tuscan Farmhouse in Italy restored by Luxus Developments, to a VIP experience at the upcoming Juno Awards in Calgary, as well as a salmon fishing trip to the Queen Charlotte Islands. Of course, Gord Bamford will be adding an in-home private concert to the list of items up for bid. Celebrities and athletes are also auctioned off to the golf teams and companies who have sponsored the event, which allows them to enjoy a round of golf the next day with the celebrity they’ve purchased, adding a very special element to the round. Also on course, golfers will be treated to a hole where Bobby Bradley, 8 time RE/MAX World Long Drive finalist will show off his skills to raise funds for the foundation. The private event to be co-emceed by singer/songwriter and television host Beverly Mahood and recording artist, motivational speaker and professional auctioneer Danny Hooper. 800 guests are expected at the Red Deer, Alberta Sheraton Hotel, starting at 5:30 p.m. on Wednesday, August 12th. The Gord Bamford Charity Golf Classic is held the next day with an early shotgun start at the Lacombe, Golf and Country Club, in Bamford’s hometown. The 8th Annual Gord Bamford Charity Golf Classic makes MusiCounts it’s featured charity for 2015. MusiCounts is Canada’s music education charity associated with The Canadian Academy of Recording Arts and Sciences. They work to keep music alive in schools across Canada with a mission of ensuring that children in Canada, regardless of socio-economic circumstances or cultural background, have access to a music program through their school. MusiCounts includes it’s Band Aid musical instrument grants, the MusiCounts Teacher of the Year Award, Scholarships, and other music education initiatives. In 2014, The Gord Bamford Charitable Foundation delivered a $100,000 donation to MusiCounts. “Music has been such an enriching experience in my life that I feel compelled to pay it forward in a lot of different ways. MusiCounts is a great match for the Gord Bamford Charitable Foundation as they deliver the gift of music to deserving kids, and music is something that every child should have a chance to experience,” says Bamford. “Gord Bamford is one of the most generous people I’ve ever met. He is the first artist in MusiCounts history that stepped up with a donation of $100,000. This contribution from the Gord Bamford Foundation will impact the lives of thousands of students throughout Alberta and across Canada by allowing MusiCounts to put more instruments in the hands of kids who need them most, “says Allan Reid, President & CEO CARAS/The JUNO Awards, and MusiCounts. The Gord Bamford Charity Golf Classic is a private event that supports and distributes funds to number of youth-serving charities like Ronald McDonald House Central Alberta, KidSport Alberta, Make-A-Wish Foundation of Northern Alberta, and Children’s hospital foundations across the country. It all starts Wednesday, August 12, 2015 at 5:30pm, at the Sheraton Hotel in Red Deer, Alberta where guests will sit down to star-studded evening of entertainment, prior to a day of golf at the Lacombe Golf and Country Club. Alberta-based businesses Waschuk Pipeline Construction and JEDCO Energy Services have stepped up to offer their continued support, a key component to the success of the 8th Annual Gord Bamford Charity Golf Classic. For two years now, JEDCO Energy Services and Waschuk Pipeline Construction Ltd. are sharing the title sponsorship. “Our support of the Bamford Charity Classic is driven by Gord’s passionate belief in helping others. Once again, we are honored in assisting Gord through our sponsorship of this event,” says Duane Sokalski, Vice President & GM, JEDCO Energy Services. A welcome back to CTV Edmonton for their support, coming on board as they join up with the event again as the television and media sponsor. “I’ve watched Gord give away guitars to kids during his concerts and as someone who has spent his whole life with a guitar within reach, I applaud this initiative that creates opportunities for others to enjoy the gifts that only music can bring,” says Lloyd Lewis, Vice President and General Manager of CTV Edmonton. Bamford is grateful for sponsorship, especially as the Alberta economy faces a difficult year. “I really can’t thank them enough for their generosity. They are the reason our event is able to grow and deliver record breaking totals, year after year,” says Bamford. The festivities for this private event begin on Wednesday, August 12, 2015 at 5:30pm, at the Sheraton Hotel in Red Deer, Alberta where 800 guests will sit down to an evening of music, fun and fundraising, prior to a day on the links at the Lacombe Golf and Country Club.